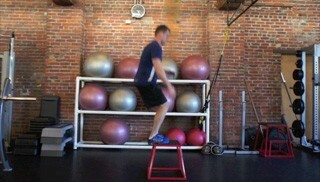 The box jump is a plyometric exercise used to develop explosive speed and power in the lower body. This exercise targets the quads, glutes and calves and is suitable for intermediate to advanced fitness levels. The flop burpee is a full body conditioning exercise. This exercise targets the legs, shoulders and arms and is suitable for all fitness levels.